On the eve of Mexican President Enrique Peña Nieto’s state visit to Britain, Amnesty International will stage a 'hard-hitting' act of creative protest to highlight Mexican police and security officials’ complicity in organized crime and torture. Amnesty campaigners will gather outside the Mexican Embassy on Monday, March 2, in a bid to address what they warn is a Mexican human rights epidemic. 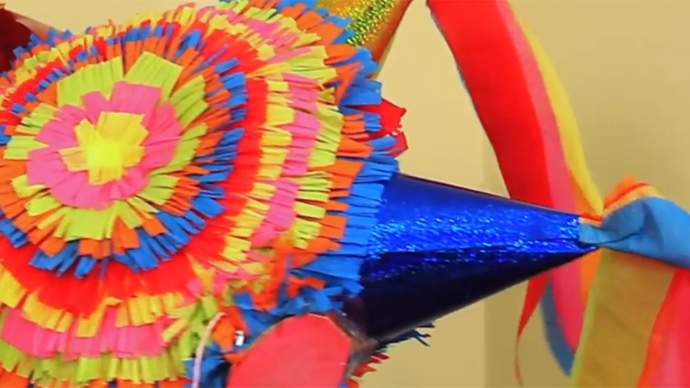 The political theater entails the bashing open of a 3-meter-wide, brightly colored piñata. A staple of traditional Mexican culture, the vessels are usually made from pottery, cloth or papier-mâché and contain sweets. Amnesty’s piñata, however, will contain a petition calling upon Peña Nieto to address what they describe as Mexico’s dire human rights record. They will present the petition to the embassy. Amnesty International says torture is “out of control” in Mexico, with the number of reported cases increasing six-fold since 2005. Soaring levels of torture coincide with the Latin American state’s “war on drugs,” which has culminated in 100,000 deaths and over 22,000 disappearances in the past nine years. In advance of Peña Nieto’s trip to Britain, Amnesty has written to Prime Minister David Cameron and Deputy Prime Minister Nick Clegg, both of whom are due to meet with the Mexican president. The letter calls specifically upon the UK government to address Mexico’s human rights abuses at bilateral talks during Peña Nieto’s stay. He said swathes of public officials in Mexico are embroiled in drug cartel criminality and torture, and the state is in desperate need of reform. Davies, who heads Amnesty UK’s Stop Torture campaign, warned the British government not to pass over Mexico’s torture record “in silence” during the talks. “Rolling out the red carpet mustn’t mean brushing Mexico’s dreadful human rights record under the very same carpet,” he said.